This Holiday Season, Songwriter Matsueda Invites You To "Eat Your Sad"
Songwriter Jay Matsueda (W'95, Good Cop Bad Cop Acoustic Music Group) has recently released his debut solo CD called "Eat Your Sad" and you should definitely give it a listen. I've known Jay for quite some time now here in Los Angeles and I've been a big fan of his music. As you'll hear on all of his tracks HERE, there is definitely a unique quality to his voice. My personal favorite of his is the track, "Nothing Inside of Me". Jay's journey is an interesting one and other Penn alumni in the entertainment industry has responded to his music. Find out how after the jump! "Some of the most compelling melodies and lyrics come out of me when I am feeling not so wonderful. Immersing myself in my emotional downturns can sometimes (not always) have musical silver linings. So what to do when, over time, I have written a relatively large collection of medium tempo, melancholy, but super-melodic tunes? I record and market them with the expectation that that's what the CD is all about. Sadness. Everyone inherently strives for happiness, but sometimes it "tests your fiber," or whatever, when you go through depressed times. Everyone goes through them. When it's your turn, dive right into them and see what you're made of. ... Ingest your sadness instead of avoiding it, make it a part of yourself, work through it and move on. That's what I did in the writing and recording of these tunes, and it worked. "Over 15 years ago, a guitar player friend passed away unexpectedly. I picked up the guitar as a way of remembering my pal. Someone showed me some basics chords, I taught myself from there, and I started writing original songs soon after. Playing and recording music has since become one of my life’s favorite pursuits. I owe it all to a friend I will never have a chance to thank directly." And Jay is getting assistance from another Penn alum in the entertainment industry. Walt Mancing (C’95) just released a full length feature film called American Macho Buddha. 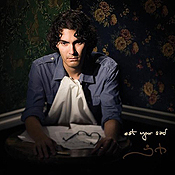 Used in it are nine of Jay's original tracks, SIX of which are on the “Eat Your Sad” CD (that's more than half the record!). In fact, the main opening tune is "Excess Emissions," track 4 of the CD, has had a bump in iTunes downloads as a direct result.